Advanced Search is a module that allows you to create the fastest layered navigation menu on the market, with criteria groups for each category, attribute and feature level, etc. Entire catalog or current section search, by step or by filter, there are many customisation options. Layered navigation is a tool that allows site visitors to be shown products that match the criteria they define, such as color, price or features. This system saves them time as they search and choose the products they want to see. Advanced Search is the most powerful layered navigation module available for PrestaShop and provides a solution for two major issues for e-sellers i.e. increasing the transformation rate and increasing traffic. It allows you to easily and rapidly add custom filters on the pages you choose and thus provide your visitors with a specific overview of the products in your catalog. Your customers will then be able to navigate around your shop quickly and will only see available products that best match their needs, thus maximising your transformation rate. In addition to providing a solution for your customers Advanced Search allows you to generate predefined results pages for search engines. These pages have a URL that has been rewritten according to the criteria you define, a H1 tag, a single description and meta tags, all whilst maintaining your internal meshing. Using this module in this way on your site, will improve your search engine ranking, which should, in turn, increase traffic. The module therefore has a dual purpose – to allow your customers to find a product at speed and to improve your natural referencing in search engines. This allows you to access a pane where you can create a search engine. This allows you to set the type of search that you want to create. – Filter: with this type of search, you can combine several criteria dynamically in order to refine your results. – Step-by-Step: your customers need to select one criteria per step for this type of search. This allows you to set the title for the search instance. This title will be displayed above the criteria selection pane. This allows you to set a private name for your tracker. This name will only be used to identify your search instances in your back office. This allows you to set the position where the search instance will be shown. You can choose from among the main PrestaShop hooks. You can also choose to place the search instance in a custom position (advanced user), by inserting the code provided in the desired location in your template. This allows you to set the CSS selector which allows Advanced Search to be placed in the central column. This allows you to prioritise a search instance. The module will therefore hide the search instances that do not have this option set to yes on a page that has several search boxes. This allows you to enter a description for the search instance. This shall be displayed above your search results. This allows you to activate or deactivate context search. If you activate context search, the products available on the page the visitor is currently viewing will be included in the search. If you deactivate context search, all the products in the catalog will be included in the search. This allows you to set the level at which the search must be carried out. You can enter a fixed category or use the category that your visitor is viewing as the search base. This allows the search to go through the sub-categories for the category used, in order to include the products they contain in the search results. This allows you to show or hide the category descriptions on the category pages during a search. This allows you to only search products that are in stock. This allows the image for the combination obtained by the search to be automatically selected and displayed. This allows the system to pre-select the combination found by the search when the user lands on the product sheet. This allows you to set the maximum number of products to be displayed per page of results. This allows you to set the sort criterion for the results. You can choose to sort by name, price, position of the products in their respective categories, manufacturer, quantity currently in stock, date added or date modified. We recommend that you sort by date added and date modified for large catalogs. This allows sort the search results in ascending or descending order. This allows you to show the number of results found. This allows you to show the number of product matches found next to each Criterion. This allows you to show a button that allows your visitors to reset all the search criteria. This allows you to hide criteria groups that do not comprise any items for the current selection. This allows you to hide criteria groups that do not have any effect on the results. This allows you to choose to show criteria that do not lead to any products. This selector allows you to choose the method the visitor may use to display the criteria that exceeds the size of the container block for the group. – Instant search (modification): this mode launches a search each time a criterion is modified. – Search on submit (button): this mode allows you to select your criteria freely. The search will not be launched until you click Search. This allows you to activate automatic scrolling for the results when the search is complete. This allows you to display the criteria selected for the search displayed. The following options allow you to set the pages on which the search engine must be displayed. Leave these set to no to show your search engine on all the pages on your shop. This allows you to restrict the display of this search engine to specific Category pages. This allows you to restrict the display of this search engine to specific Product pages. This allows you to restrict the display of this search engine to specific products in these categories. This allows you to restrict the display of this search to specific manufacturer pages. This allows you to restrict the display of this search to specific supplier pages. This allows you to restrict the search to be displayed on special pages, such as the cart or the forgot password pages. This allows you to activate or deactivate the current search engine. This allows you to delete the current search engine. This allows you to create a copy of the current search engine. This allows you to launch re-indexing. Re-indexing is the process during which Advanced Search updates all the criteria groups for the search engine, along with their values. e.g. if you edit the values for an attribute, you will have to re-index the module engine so that it takes the modifications into account. This column contains all the criteria groups that are available in your shop and can be added to your search engine. They are sorted by type: attributes, features and associations, etc. Just click a criteria group to add it to your search engine. This column contains the criteria groups that are currently used for your search engine. This is where you can edit or delete them. The order of the criteria groups in this list defines the order in which they are displayed on your shop. Just click and drag a group to change the order. This allows you to set the name to be used for this criteria group. You can set one name for each language that has been installed on your shop. 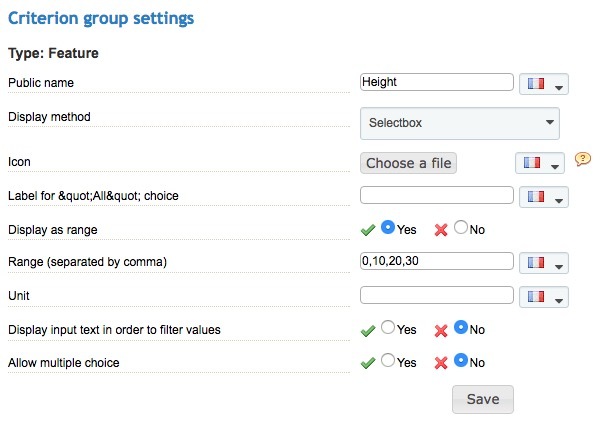 This allows you to set the type of selector to be used for this criteria group. This allows you to set an icon for your criteria group. You can set one icon for each language that has been installed on your shop. You have the following tree structure: A level 1 category, title 1 and content 3 sub-categories A, B and C and a level 2 category, title 2, also containing 3 sub-categories, D, E and F.
You have created two criteria groups: one for level 1 categories that you have configured as needed and a second one for level 2 categories, for which you have activated the Show Sub-Categories Directly Associated with the Criteria Previously Selected option. Then go to your shop and select category 1 for the first criteria and only criteria A, B and C will be available for group 2. This allows you to provide a search box in your drop-down menu so as to allow the values it contains to be filtered. 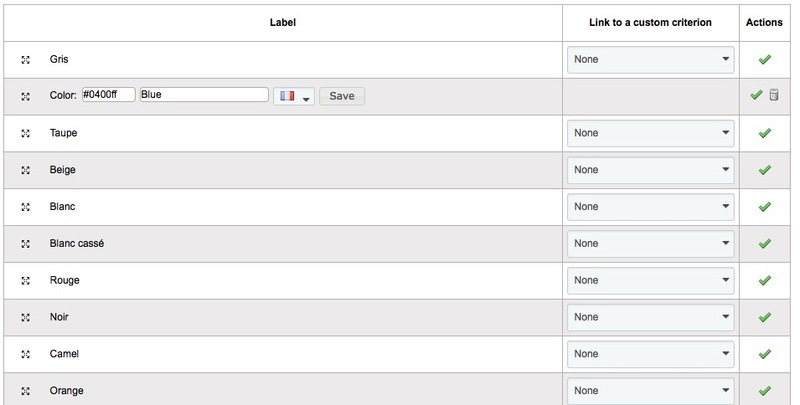 This allows you to authorise your customers to select multiple values for this criteria group. This allows you to set the maximum number of criteria to be shown for this criteria group. Enter 0 to show as many criteria as there are values for the group. This allows you to set the start point for the tree structure for the categories to be displayed. This allows you to set the text for the All option, i.e. the default option in a drop-down menu. This allows you to display the attributes as ranges. Activate this option to gain access to Range and Unit options. The first one allows you to generate comma-separated numerical tiers for your choices. The Unit option allows you to set the unit of measurement for your criteria. This unit will be automatically added to the end of each value. This allows you to set the step for your cursor or numerical interval. This value will be applied for each deviation between two group values. The step must be consistent with the values in the group. Too great a step for the criteria may provoke display inconsistencies. This allows you to set the measurement unit for your criterion. This value will be automatically added to the end of each value. Activate this option to gain access to the Range and Unit options. The first one allows you to generate comma-separated numerical tiers for your choices. This allows you to set the title for your new custom criterion. This allows you to set a color for your new custom criteria. 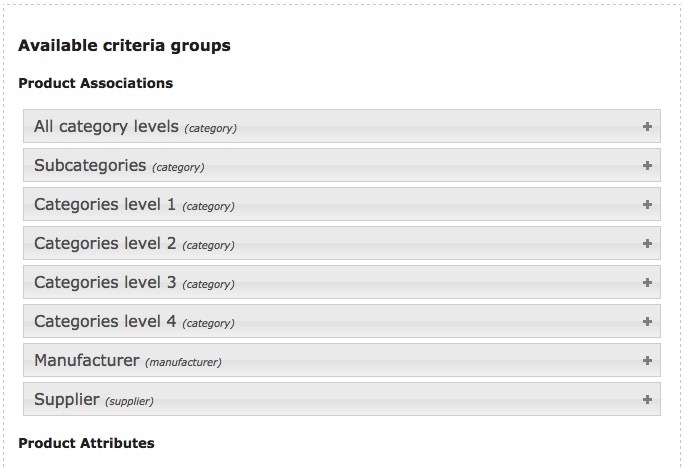 This allows you to set the order for the criteria displayed in a criteria group. – Custom Position: this allows you to manually set the sort order by dragging and dropping the criteria to the desired position. – Alphabetical: this allows you to set an alphabetical sort order. This allows you to choose the order for the criteria. You can choose ascending or descending. Advanced Search allows you to group several criteria under a single custom criterion. Let’s take a group color criterion, for example. The shop has several variants for each color, but you do not want to display all of them. We are therefore going to create a custom criterion for each of the colors to be represented, then allocate all the variants to this new criterion. To do this, go to the edit window for a Color criteria group, then create a custom criterion. Enter its name and enter a color for the new criterion, then save it. All you need to do now is link each color variant with the corresponding custom criterion. When a customer selects Blue as a criterion, Advanced Search will then show all the results for blue variants that have been assigned to the criteria. This page allows you to create or edit a pre-defined results page using the criteria groups for your search engine. To do this, just click and drag the criteria into the zone provided to add it to the generation. – Meta title: this allows you to set the title for your results page. This title will, for example, appear in the title bar for a browser tab. – Meta title: this allows you to set the description for your results page for the spiders. Your customers will not see this description. – Meta keywords: this allows you to set the keywords from your results page for the spiders. These keywords will not be visible on your shop. – Title (H1): this allows you to set the search title, which will be displayed above the results. – Simplified URL: this allows you to set a simplified URL for your results page. Finally, you can link the page being created with an existing results page by using the table to search the existing pages and clicking the plus sign for the page to be added. This page allows you to create multiple results pages by generating all the options for the selected criteria. A tab pane containing all the possible values is given for each criteria group. Just tick a criteria to add it to the list of URLs to be generated. Finally, you can also automatically create links between the results pages generated by setting Automatically Add Crosslinks between the pages generated to Yes. This allows you to delete empty results pages. This option should be used if you delete a criterion, for example. This allows you to automatically regenerate the SEO information (meta) for the results pages. – Meta Title: the title of your results page. This title will appear in the browser tab title bar. – Meta Description: this is the description for your results page. Your customers will not see this description. – Meta Keywords: these are the keywords from your results page for the spiders. These keywords will not be visible on your shop. – Title (H1): this is the search title, which is displayed above the results. – Simplified URLs: these are the shortened URLs for the results pages. This allows you to retrieve a list of all the URLs generated by the module for the current search engine. – The first one contains a list of HTML links, that allows you to use them in templates, for example. – The second contains the same list of links but in CSV format, so that you can store them in an external file. This allows you to activate the Advanced Search cache, which is independent to the cache for your shop. This allows you to automatically launch indexing when you add, edit or delete an item from your search engines. This allows you to change the display of the Category pages on your shop. Once activated, it allows you to display the products associated with all the sub-categories for the current category. This allows you to add the CSS code so that you can customize Advanced Search (advanced user). This allows you to retrieve the URLs that launch a re-indexing job for one or all the search engines. These links are to be used when setting up CRONjobs. This allows you to clear the cache for all your search engines. This allows you to start immediate re-indexing of all the search engines without needing to set up a CRONjob. This allows you to delete all your search engines.